Something for the holiday "grind", our very popular Snowman series of mills are also perfect for using all winter long! The Fletchers’ Mill Snowman Peppermill is one of our most popular designs. A perfect gift for kitchen or table. Something for the holiday “grind”, our very popular Snowman series of mills are also perfect for using all winter long. Available in a 4” pepper mill or salt shaker or a 6” pepper mill or salt mill. Choose from our original snowman, or our latest Snowman featuring a black hat for those cold winter days! Both sizes are available in 4″ pepper mill or salt shaker, and 6″ pepper and salt mills. 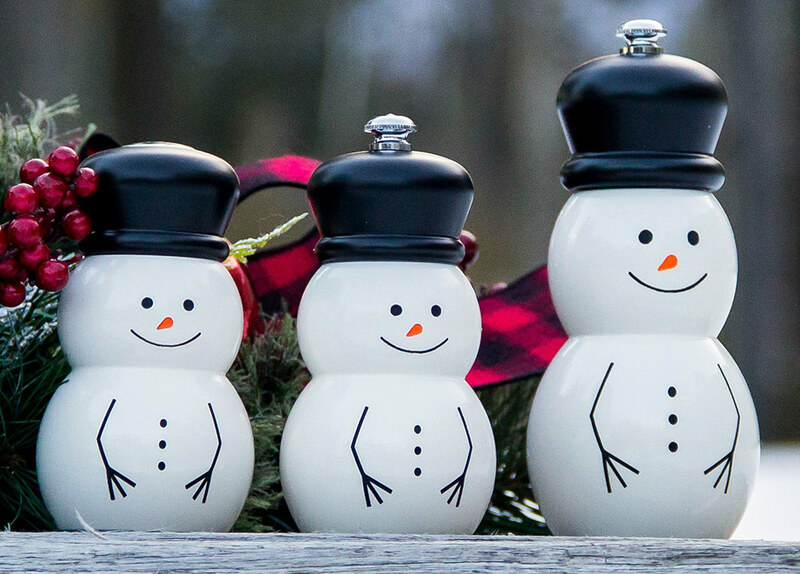 $29.95 — $39.95 Shop Mini Snowman Pepper Mill & Salt Shaker - 4"
$34.95 — $44.95 Shop Snowman Pepper Mill & Salt Shaker with Hat - 4"
$49.95 Shop Snowman Pepper Mill & Salt Mill - 6"
$49.95 Shop Snowman Pepper Mill & Salt Mill with Hat - 6"